Situated on a river, this campground is 2.4 mi (3.9 km) from Phil Rogers Park and 2.7 mi (4.3 km) from Rainbow Beach. Carlo Sand Blow and Great Sandy National Park are also within 6 mi (10 km). 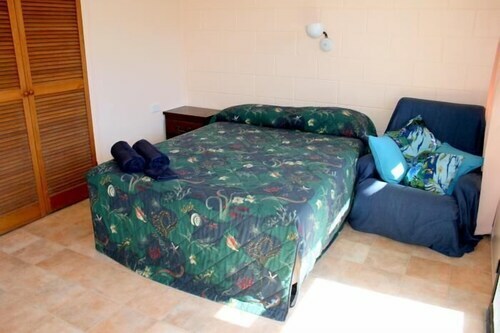 Situated near the beach, this motel is within a 15-minute walk of Phil Rogers Park and Rainbow Beach. Great Sandy National Park and Carlo Sand Blow are also within 3 mi (5 km). Nestled on the beach, this Rainbow Beach apartment building is 1 mi (1.6 km) from Rainbow Beach and 1.2 mi (2 km) from Phil Rogers Park. Inskip Point and Carlo Sand Blow are also within 6 mi (10 km). 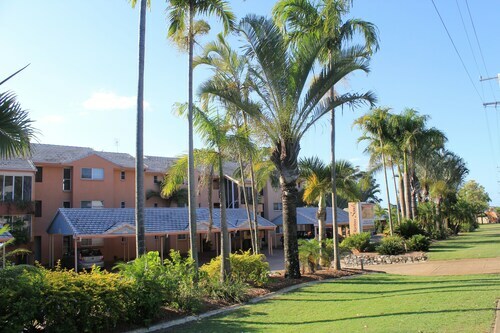 Situated by the ocean, this apartment building is within 1 mi (2 km) of Phil Rogers Park and Rainbow Beach. Great Sandy National Park and Carlo Sand Blow are also within 3 mi (5 km). These apartments are located throughout the area in Rainbow Beach. Nestled on the beach, this Rainbow Beach apartment building is within a 15-minute walk of Phil Rogers Park and Rainbow Beach. Great Sandy National Park is 2.5 mi (4 km) away. Offering direct access to the beach, this Rainbow Beach apartment building is within 1 mi (2 km) of Phil Rogers Park and Rainbow Beach. Carlo Sand Blow and Great Sandy National Park are also within 6 mi (10 km). 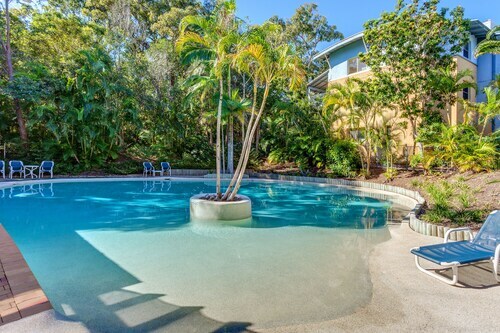 Situated near the beach, this luxury apartment building is within a 15-minute walk of Phil Rogers Park and Rainbow Beach. Great Sandy National Park is 2.5 mi (4 km) away. Taking its name from its colourful cliffs and sand dunes, Rainbow Beach is the gateway to stunning Fraser Island, and so much more! 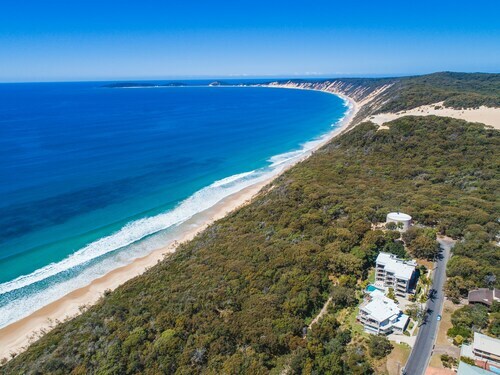 A beautiful spot for paragliding and skydiving, Rainbow Beach has natural sights like the Carlo Sand Blow within walking distance of the scenic town centre. Whether you’re en route to Fraser or just looking for a place to escape the crowds, book your Rainbow Beach hotel with us and find your pot of gold. Rainbow Beach’s sands are thought to have begun forming since the last Ice Age, with iron oxide and vegetable dyes giving them their amazing mix of over 70 colours. A local Kabi legend tells of a rainbow-coloured god who was smashed into pieces on the cliffs in a fight with an evil man. 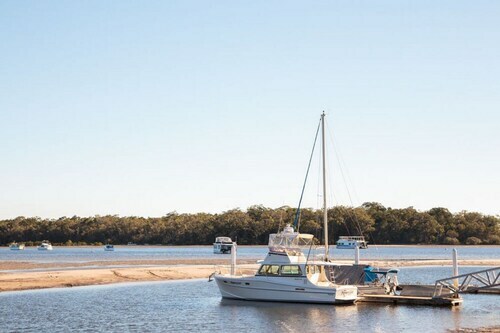 The town was accessible only by boat until 1969, when roads were built to accommodate the local sandmining industry. Sandmining lasted until 1976, and now Rainbow Beach is a quiet town with a population of just over 1000 and an influx of thousands more visitors every year! Don’t miss your chance to visit Carlo Sand Blow! Named after a member of Captain Cook’s deck crew, it’s made up of 15 hectares of sand mass and offers spectacular views of coloured sand and ocean. You might also catch hang-gliders launching from the top of its cliff, or whales moving about in the ocean between August and October. And it’s only a short bushwalk from Cooloola Drive, close to the main part of town. The Great Sandy National Park covers 2,196 square kilometres and can be accessed via 4WD. Deserted beaches, bush, wildflowers and lakes await you. For a refreshing swim, take a bushwalk to Poona Lake, which you can access from Rainbow Beach Road. If you’re an adrenaline junkie or just love a good view, Rainbow Beach has hang-gliding, paragliding or skydiving with impressive views over Carlo Sand Blow and Fraser Island. Now that’s worth overcoming your fear of heights for! Close to the main swimming beach, you’ll find the town’s main strip on Rainbow Beach Road, with cafes, shops and a nice big green park. For a colourful time, book a flight to Brisbane or Maroochydore with us and hire a car or catch a bus to Rainbow Beach. 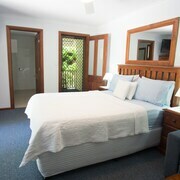 If you want to continue onto Fraser Island, take a look at our Fraser Island hotels. Need insider tips on must-see attractions in Rainbow Beach? Check out our Rainbow Beach travel guide! 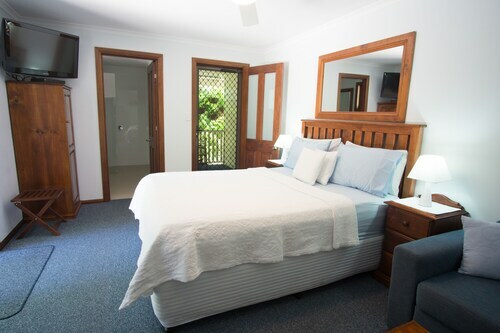 How Much is a Hotel Room in Rainbow Beach? 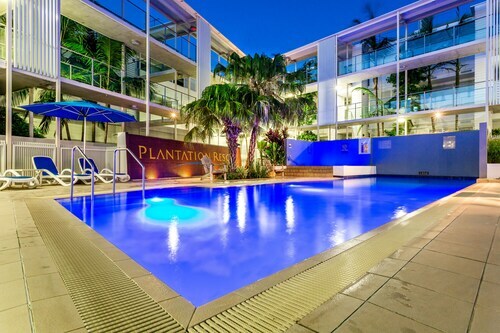 Hotels in Rainbow Beach start at AU$114 per night. Prices and availability subject to change. Additional terms may apply. We stayed in a two bedroom bungalow which was perfect for one night with two kids. Everything is a bit old but it was clean. Great location with clean tidy rooms, nice pool with spa and a sauna to. My husband and I stayed in the Penthouse, unit 14. Absolutely amazing views as soon as you walk in the door and down the hallway. Everything was clean and spotless. It was awesome being able to see the beautiful views of Tin Can Bay, Fraser Island and the beach from the kitchen, lounge and bedroom. The only disappointment was, for a Penthouse appartment and the price, that the kitchen could of had a decent coffee machine instead of a kettle with instant coffee (first world problems, I know😜). The infinity pool has amazing views as well and was very relaxing.